Extensive watering ahead of last Sunday's well supported Braes of Derwent point-to-point at Downhills, Corbridge, produced near perfect jumping ground for the time of year. A total of 47 runners faced the starter on the seven race card, with the season's top prize-money fund of £2500 on offer. It turned out to be a good day for the bookmakers with 5 of the 7 favourites beaten, and also a memorable one for some of the Northern Area's young riding talent with 5 of the winning jockeys aged 23 and under. Iveston farrier and trainer, Russell Ross saddled the winner of the Douglas Chapman Memorial Braes of Derwent Members Race for the seventh time as Hubble Bubble (left) finally came up trumps after a string of misfortunes earlier in the campaign. In command from the outset, the 7 year old was almost a fence clear on the final circuit and coasted home a distance in front of stable companion, Paint Me Silver. After opening his seasonal account, Charlie Johnston, 20, a 3rd year veterinary student at Glasgow University, said: "He was very keen in front and didn't have much respect for some of his fences but always found a leg." Former French chaser, Nirvana Du Bourg (right) has been rejuvenated since joining Manfield near Scotch Corner trainer, Richard Wilson and ended a five year losing run in the Dr Syntax Inn Ladies Open Race. Fitted as usual with a tongue tie, ear plugs and cheekpieces, the 10 year old finally collared long time leader, Seafield Bogie at the last and outbattled his rival on the flat to win by half a length in the hands of 22 year old Alnwick-based funeral director, Emily Young. The gelding was sold for 160,000 euros in December 2006 following his 2 Chase wins in France, but showed no form in four starts for Venetia Williams and Nicky Henderson and was picked up by Richard Wilson's wife, Wendy for only £1000 at Doncaster Sales in May 2008. 16 year old Jedburgh Grammar School pupil, Joanna Walton returned from a fortnight on the sidelines to partner her first winner on the unfancied Marfleet (left, brown cap) in the Tyne Valley Plastics Restricted Race. Always close up on the final circuit, her mount took it up at the last and stayed on strongly to beat Maura My Love by 4 lengths. Barry Wharf's charge is trained at Bonchester Bridge by Diana Walton and daughter, Joanna, a graduate from the pony racing ranks, said of him: "He loves top of the ground. That was awesome and so unexpected." Horse Feeds Intermediate Race before being gradually reeled in from three out by course winner, Dystonia's Revenge (right). The latter ranged upsides going to the last, met it perfectly and found extra up the run-in to secure a one length verdict. This was a 4th winner of the season for Catherine Walton, 23, and extended her lead over Kelly Bryson in the Northern Area Ladies Championship to 8 pts with only five fixtures remaining. Winning owner, John Blacklock said: "He needs a stiff track and would prefer a bit more cut but, all being well, now goes for the Heart Of All England Maiden Hunters' Chase at Hexham on Saturday April 30." Ex-hurdler, Moment Present (left, grey), made virtually all the running under Northleach-based jockey, Luke Morgan in the Northern Plastic Surgery Associates Men's Open Race and easily kept Salveo and Master Builder at bay from four out to score, going away, by six lengths. Sedgefield trainer, Chris Dawson was on hand to see the 6 year old's victory even though he is still recovering from a dislocated hip sustained in a heavy fall from his charge at Crossford three weeks ago. Dawson said: "He barely stays three miles and that was only his 5th start over fences. He might turn out again at Easingwold on Easter Sunday but his main target is a two and a half mile Perth Novices Hunters' Chase on May 12." Dawson left shortly afterwards and arrived at Mordon in time to see stable companion, Silk And Roses get off the mark in a Maiden Race at the Cleveland meeting. Moment Present ran 26 times under Rules before joining Dawson and proved that he is a versatile sort by winning on the Flat at Saint Cloud in 2008 before scoring twice over hurdles at Huntingdon in May 2009. He was bought out of Charlie Mann's yard by York owner, Michael Humphreys for 6000 gns at Ascot Sales last August. One Black Cat (right) provided Adam Nicol, 21, with his first winner of the year in the Tow Law Open Maiden Race. 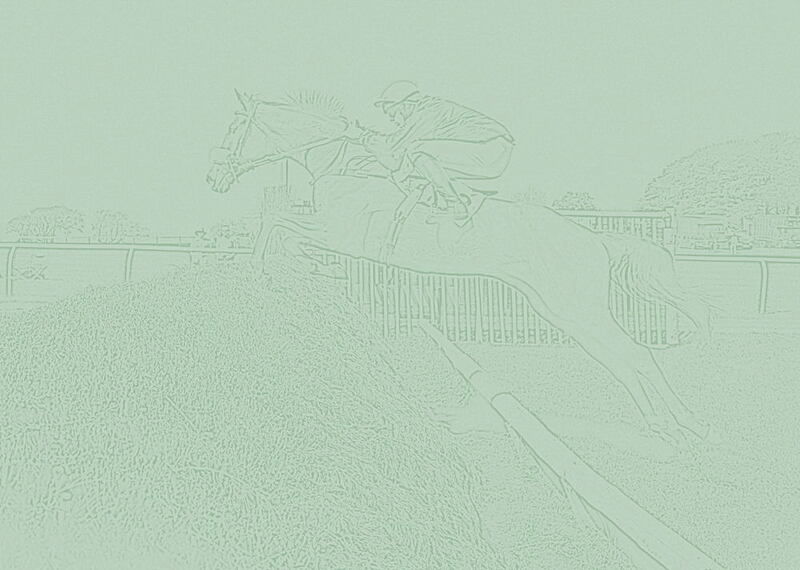 Always prominent, the 8 year old mare found another gear to pass Naughty Diesel and Rennington Blue between the last two fences and had 3 lengths to spare over the latter at the line. The mare, bought privately as a 3 year old by trainer, Clive Storey from her breeder, Mary Bowie, was a first winner as an owner for John De Geir. The concluding USL Group Open Maiden Race for 4, 5, 6 and 7 year olds saw Salmon Rising (left) land the gamble of the day, after being backed down from 10/1 to 7/2. Partnered by Tristan Davidson for the first time and fitted with first time blinkers, the 7 year old was always going well and led throughout the final circuit. Staying on strongly from three out, he had 10 lengths to spare at the line over Samson Collonges with The Boozy Bishop a further 5 lengths away in third. Elizabeth Brockbank's home-bred gelding is trained at Wigton by her husband, John. The main action was followed by two pony races sponsored by ND Micrograve. The contest for ponies 138 cm and under saw Ben-Neagh Spring Rascal (Harry Reed) (below,left) complete a hat-trick from Hepplewood Berkeley Square (George Crawford) and Finbarr (Connor Murtagh). The second race, for ponies 148 cm and under, was won by Miss Tiny (Lorcan Murtagh), (below, right) from Glenbeigh Sea Breeze (George Innes Ker) with Chiumbo (Ross Chapman) in third.